Nelson Eddy and Jeanette MacDonald, who made eight classic movies together for MGM including their first film together, Naughty Marietta and their last pairing in I Married An Angel, sometimes starred in gems for the studio on their own. Now, DVD retailer Movies Unlimited is presenting four titles starring the singing duo in solo performances through an arrangement with Warner Archives. 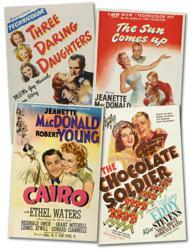 With the release of these four films, there remains only three more MGM Jeanette MacDonald and Nelson Eddy treasures not yet on DVD. The Sun Comes Up (1948) stars Jeanette MacDonald along with legendary cinematic collie Lassie in a fine family film, which finds the singing actress seeking solace after her son dies. She finds it with a young orphan boy and the beloved canine while on retreat in a country cabin. Lloyd Nolan, Claude Jarman, Jr. and Percy Kilbride (“Pa Kettle”) also star; songs include ”If You Were Mine” and "Un Bel Di" from Puccini’s Madama Butterfly. Movies Unlimited is one of the world’s oldest and most reliable video retailers of DVD and Blu-ray titles, specializing in hard-to-find movie classics. The titles can be ordered through their website at http://www.moviesunlimited.com or by calling 1-800-4-MOVIES. The Philadelphia-based company also publishes their annual encyclopedic 800-page Movies Unlimited DVD Catalog.